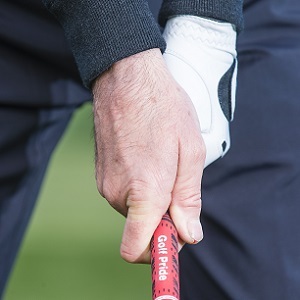 If you think your grip might be costing you crucial clubhead control, please don't hesitate to ask for some simple advice on how to groove a better method. A poor grip can cause a host of issues in the swing so avoid the temptation to turn a blind eye and play on regardless. Here are a couple of common errors to look out for. One of the most common grip-related faults is to set your hands on the club in a way that causes it to close through impact. This is called a 'strong' grip and you will see three to four knuckles on your left hand at address and the 'v' between thumb and forefinger of your right hand will point to the right of your right shoulder. 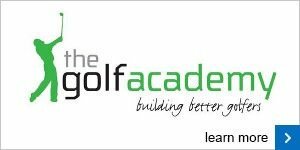 This will cause you to take the club away on the inside which in turn makes delivering the club back to the ball on a neutral path hard to find. 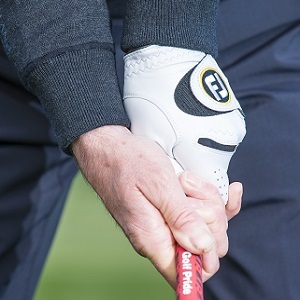 The weak grip arises when the left hand starts too far underneath the club. As the right hand wraps over, the 'v' between the thumb and forefinger of your right hand points at your chin or even towards your left shoulder. 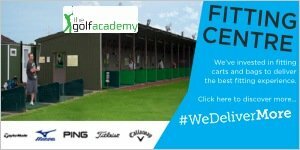 This will cause you to pick the club up too much in the takeaway, sending the clubhead off the ideal swing path. In this situation, you'll usually suffer from a slice as the face will want to open at impact. As you can see from these images, a faulty grip makes a neutral swing path almost impossible to find. If you try to play on without fixing the issue, you'll do harm to your game in the long run. With a few simple tips and exercises we should be able to address the problem so please don't hesitate to come in and see me for help.